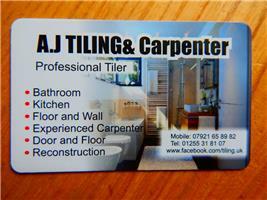 AJ Tiling & Carpenter - Carpenter, Tiler - Tiling based in Clacton-on-Sea, Essex. I specialise in tilling and carpentry. I have many years’ experience in home renovations, first and second fix, door hanging, bespoke furniture making, laminate flooring, wall and floor tiling, kitchen and bathrooms.